I wasn't sure my (then) 6-year old daughter would care much for a really old Tarzan movie. 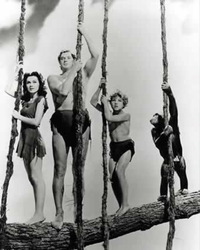 But last fall, there we were -- lying across the sofa watching "Tarzan Finds A Son" on cable. She watched the whole thing. When it was over, she had become quite a fan of Tarzan, Jane, Boy and -- of course -- Cheeta. McKensie can always tell when a movie is real old because it's "gray", as she puts it. She asked me if Tarzan (Johnny Weissmuller) was still around. I carefully explained that the movie was made so long ago (1939) that all the actors were probably no longer with us. Well, I was half correct. and Cheeta (the Chimpanzee) is still alive and -- amazingly -- they're both about the same age. Johnny Sheffield just turned 75, and lives in California. Cheeta the chimpanzee just turned 74, and lives in California. One of them spends his time nowadays watching old movies on TV.... eating burgers.... going for rides.... painting.... and playing the piano. The other still makes public appearances occasionally to talk about his days portraying Tarzan's son, and movies he later made as "Bomba the Jungle Boy".